I did this one a while ago and it has been posted on a number of forums but just realised I haven't shared it here yet. Note that with J113 that has higher yfs gain limit resistor of first stage was altered from 1K to 3K Ohm’s. The Source Voltage and the Drain Source Voltage set the headroom of circuit. If say J201 or 2N5457 were to be used in the circuit then connect a 10M Ohm resistor from B+ to gate to lift the gate a bit and allow some headroom and for second transistor then add an input capacitor of 47nF and thus allow to shift DC on the gate of the second transistor. When biasing check for about 2V gate range to allow circuit to run fairly clean. You can replace the lower resistor in Bass control circuit to adjust mid point- note that center frequency is about 740Hz and so when you have Bass and Treble turned down you get a peak filter with 740Hz center but when you use mid control as described you won’t access the exact frequency since the lower resistor off sets the whole filter. Coming soon is a version of SBEQ with Mid control and that is made with a gyrator connected at Source of first stage and then gain limiting resistor is increased to 5K1 and the gyrator only makes boost at center frequency but it allows both Treble and Bass to be boosted while retaining mid focus and for anyone who wants to build their own it would be very simple to add a gyrator centered at 800Hz with a Q of 1,6 and thus neither Bass or Treble can affect Mid control but it will be centered at reference frequency. I built this. Works like a charm. Great layout, excellent work, as usual! Any other JFET that's suitable to replace the 2N5457 and 5458? I can't seem to find those in stock. Would the 2N5459 be suitable? Done, used 5457........very nice..... very transparent. hmm, i just finsihed this and it sounds nothing like transperent really, colors the tone alot for me adding a nasty fizzyness to overdriven tones. could i maybe have a short? it's like it's overdriven, gives it a bit of fuzz in a way, even when volume is turned down. Check for shorts or replace the JFETs, which JFET did you use? Used 5457, can't really find any shorts either, also tried replacing them with no success. It's sorta boosting the signal, even when volume is turned town to 10%. Check component placement then, maybe one resistor or capacitor leg has gone in somewhere it really shouldn't....it had happened with me on some other build........If nothing else helps build a new board, because this thing is very transparent and adds a definite mojo to any guitar's tone. Is there a way to control the mids? No. Not in any easy way. That would mean adding one more stage to the circuit. Just built this using 5457's. It is my third build and not working right. When I turn this one on the signal level drops considerably. All the pots seem to work in reverse too. When I turn them clockwise, it lowers bass, treble or volume. Any idea what might be the fault? I just built this one today. I tried two Fairchild 2N5458's first and its output was VERY low (I couldn't even get it to unity gain with all of the controls dimed!). then i replaced them both with 2N5457's (also Fairchild) and it's loud and proud! awesome sounding pedal! thanks for posting it. I did it like Carvin does on their amps that have a bandaxall tone stack. I removed the 1K resistor to ground on bass lug 1, then connected that to an A50K pot lug 1 (new mids control)and connected lugs 2&3 on the mid pot to ground. then I just added a 47n cap between lugs 1&2 on the bass pot. Hi John, wondering if you could comment on how well the mid control worked out for you. Sounds like you built this first without mid control, so you would have a point of reference for a before and after. Did the mid control addition take anything away from the original controls, or only add more goodness, if you know what I mean? i have a few J201 in stock, will those do instead of the 5457? i know they can vary a lot in batches, but will it even work? :) thanks! Well it will work, but it may not bias correctly with the resistors selected for the 2N5457. I'd recommend socketing the JFET so you could potentially try a few, any maybe use trimmers instead of the source or drain resistors so you can fine tune it. Yes i'm aware of this, but i need trimmers for BOTH drain and source pins? what would be a good range for the trimmers? and what voltage should i get for each as a good starting guide? thank you so much for your great contribution! - wondering if you could comment on how well the mid control worked out for you. If you built this first without mid control, you would have a point of reference for a before and after. I need a slight clarification on this one. You have two parts symbols on here I've never seen you use before. They're labeled 1u and are grey. I'm assuming those are electrolytics and the mark at the bottom is reference for the negative end. Can anyone confirm this. Thanks. looking forward to this pedal. I bought a big collection of axial tantalum caps a while ago, and when I did this layout it must have been around the same era, so I was trying to accommodate them where I could. So don't worry about it, any cap of any type will work in there fine. And yes, the polarity (if you use polarised caps) in noted. Thanks, go on the build board now. I have a newbie question. There are 2 grounds on the board. Do they both go to the ground on the power. Usually there is only 1. I appreciate it. Yes all grounds need connecting together so run 2 wires to the offboard ground points, or daisy chain. Whatever method you prefer as long as they're all common. I've done this a few times in some older layouts to avoid adding an extra column just to have a ground link on the board, but I'd probably re-do it now to avoid the two connections. If you like you could just solder the 100u cap straight across the positive and negative lug of the DC adapter instead of mounting it on the board with the additional connection. I like this build. Thank you for your help. Here is a picture of the pedal that I built. I really am liking it. Wondering if it would be possible to mod this to make the volume pot function more as an attenuator instead of a boost? I'd love to have all of the eq functionality, but would like to be able to reduce signal when engaged to clean up a pushed signal on a single channel amp without losing tone. Hey evryone built this. Used 2n5457 and it sounded fizzy and low output. Tried another couple of 2n5457 and now it sounds great! Should it work properly with high impedance input signal? I built it with 2sk117 transistors and got distorted sound from guitar pickups. Should I use buffer in front of it? Installed Drain 50k trimmers, changed transistors for bf245a - still have distorted sound when picking hard. Any ideas? the pinout for those is different. did you placed them right??? Yes, I know. Built it again, tomorrow testing. After that I noticed that probably one of the grounds wasn't wired correctly (bad soldering). Thanks for reply. OK, got it worked. Faulty ground soldering joint. Sounds very transparent, installed as onboard equalizer in my project guitar. does it work with 9V? if yes, could you give us your voltage readings with 12V? Sound is OK but I didn't noticed headroom increase between 9v and 12v. I want to try with 18v - I know I should change electrolitic caps to 25v. 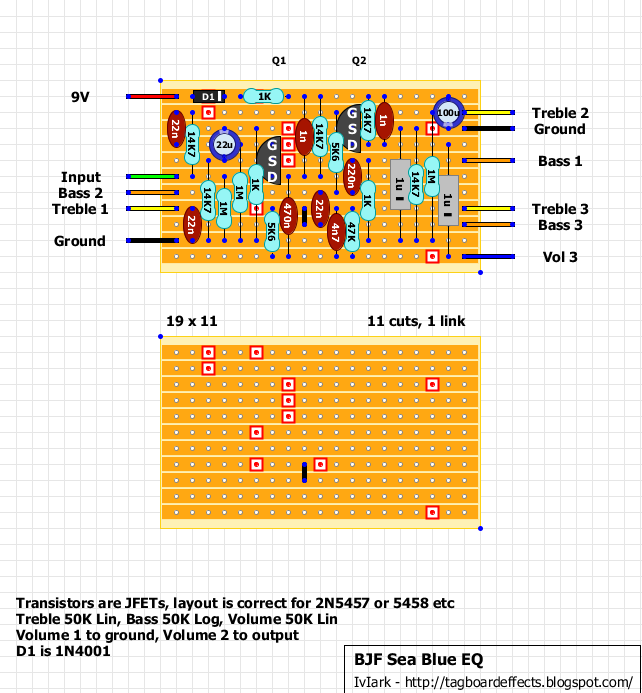 Will it work, or should I change any Q resistors? as i expected..those 14k7 resistors, are biasing the j-fet for 9v. if you want to use 12v, then you MUST socket those 2 resistors, and find the values that give you half of the supply voltage (or near that). you should get something like 6V on the drain pins. 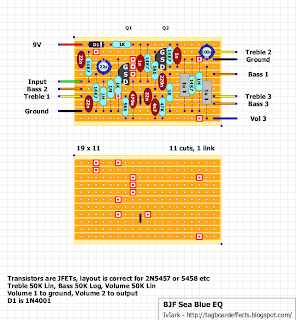 you can always mod the layout so you can use trimmers in the place of those resistors, but that's a more complicated sollution now that you have the board ready. Changed Drain resistors for 22k, got 7v at Drains. Still have very slight distortion when hard picking. Should I change Source res. as well or increase resistance at Drain even more? I prefer asking before try - the circuit is deeply hidden under guitar pickup.Every attempt require opening the instrument, slacking strings, pulling the pickup out, etc. i did that too to my old guitar with a booster..
you should first try it outside the guitar mate! I see. There are four 14,7s. Should I change just the Source ones? Cheers. I built this with Fairchild 5457s and it was a crappy fuzz box. Swapped to Fairchild 5458s and it sounds amazing! Weird, huh? Exact opposite to John. It's still a little compressed which surprised me but it sounds great as a boost . It seems to add clarity somehow. How could I decrease the bass in this? By decreasing the 22nf?